The Hertz Corporation has signed an agreement with Mitsubishi Motors in the UK to add the pure-electric vehicle (EV) i-MiEV city car to the fleets of Hertz and car sharing club Connect by Hertz in the UK. The rollout starts today, with two Mitsubishi i-MiEVs now available for Connect by Hertz members to zip around London. Hertz plans to add further i-MiEVs to its fleets throughout the year across the UK, as well as offering vehicles for corporate and university pool fleets. Customers will be able to charge their vehicles at Hertz charging stations located across the capital as well as at Heathrow and London City Airport. In addition, customers will have access to the Source London public charging points which are being rolled out across the city by 2013, as part of the Mayor's plans for London to become the electric vehicle capital of Europe. Michel Taride, President, Hertz International, commented: "Our partnership with Mitsubishi Motors in the UK to provide i-MiEV cars to our Connect by Hertz members and Hertz customers in the UK is a vital part of our global Electric Vehicle and sustainability initiatives. We are excited that from today, our customers can experience the joy of 100% electric driving with the i-MiEVs, which offer surprising power and a smooth, quiet ride." Managing Director of Mitsubishi Motors in the UK, Lance Bradley added: "We are delighted to partner with Hertz and to be able to offer the i-MiEV to their customers. The i-MiEV is a very important vehicle for us, making a statement to the global car industry -- being the first mass-produced, zero emission full electric vehicle ever. It has a vastly reduced effect on our environment, yet demands absolutely no compromise in terms of safety, comfort, convenience or fun. It is a vehicle for the future, available right now -- built for the modern city commuter, in a stylish, super-modern, high-tech and exciting package." Engineered to be the perfect car for the urban environment, the Mitsubishi i-MiEV can park in tight spaces and breeze through traffic while comfortably accommodating four adults. It has a range of over 90 miles and can be charged up to 80% via a quick charging unit in as little as 30 minutes or fully charged overnight via a standard 3 pin domestic plug socket. 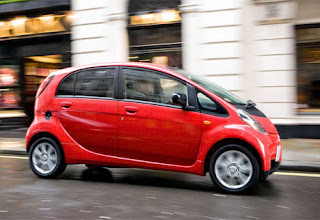 In the UK, the Mitsubishi i-MiEV was the first mass-produced fully electric vehicle to market and has been involved in official government trials since mid-December 2009. The Mitsubishi i-MiEV is also the world's first ever pure-EV to have received the Euro NCAP 4-star Rating. Hertz's electric vehicle initiative with Mitsubishi Motors in the UK further demonstrates the rental provider's commitment to providing customers with a variety of zero-emission mobility solutions. The partnership forms part of the European development of Hertz's Global Electric Vehicle Program, launched in December 2010, with the Mitsubishi pure-EV i-MiEV complementing both Hertz's existing Green Collection and the Connect by Hertz car sharing fleet. As the world's largest general-use car-rental brand, Hertz is uniquely positioned to introduce multiple groups of consumers -- urban drivers, university students, travelers and corporations -- to all-electric and plug-in hybrid vehicles. As part of this strategy, Hertz is forming partnerships with manufacturers, charging station providers, municipalities, NGOs, corporations and other stakeholders. All the cars in Hertz's Green Collection in Europe can be reserved by make and model, and offer a CO2 output level of less than 140g/km, making them more environmentally friendly than most other cars. The conventional cars in the Collection also achieve 45-65mpg, depending upon vehicle size, so they are more fuel-efficient too. Together, that means customers can enjoy their journey even more, safe in the knowledge that they are saving along the way.